I look longingly at fabrics but the price is quite significant. I think maybe I should buy a fat quarter every so often...but then I worry that many of the quilts I see in the shop are all so co-ordinated with "ranges" and aren't really piecemeal at all. So am I better to buy all the fabric I need in one season because the dyelots are all in similar palettes? 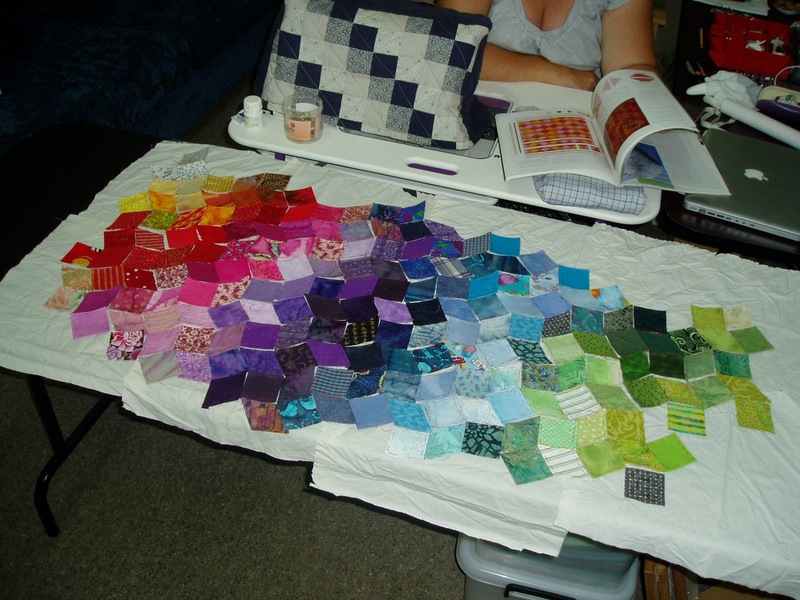 Do you buy all your quilt fabric in one go?" I started emailing an answer to her but it got longer and longer so I've decided to post it here for others who are interested too. The price of fabric IS significant and I am constantly amazed at how much people seem to buy when I look around the net. However, the prices are a lot cheaper in America so that might bias my opinion. Some of my stash - blue seems to be a favourite of mine. ﻿Because I do a lot of quilting, I like to work from a 'stash' - a collection of lots of pieces of fabric that I gathered here and there. I work out what I want to make (I rarely follow a pattern completely) and then sift through my stash for pieces that will go together. This has it's downfalls - sometimes I want to use a certain fabric but don't have enough and I know I won't find it in the shops again, but this forces me to be creative. I also have to make sure that when I'm buying bits and pieces here and there that I gather a range of tones, pattern sizes and colours (or I'd just end up with stacks of mid-tone blues!). I have quilting friends who work differently. They find what they want to make, work out how much of each colour/pattern they need and then go and buy it all at once. 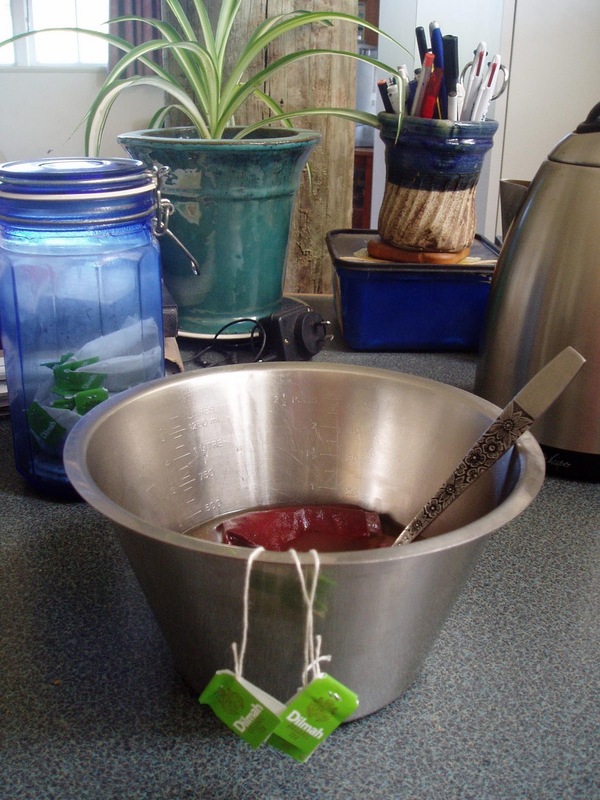 They spend a lump sum all at once and they don't tend to have many leftovers to use on little projects just as a whim. 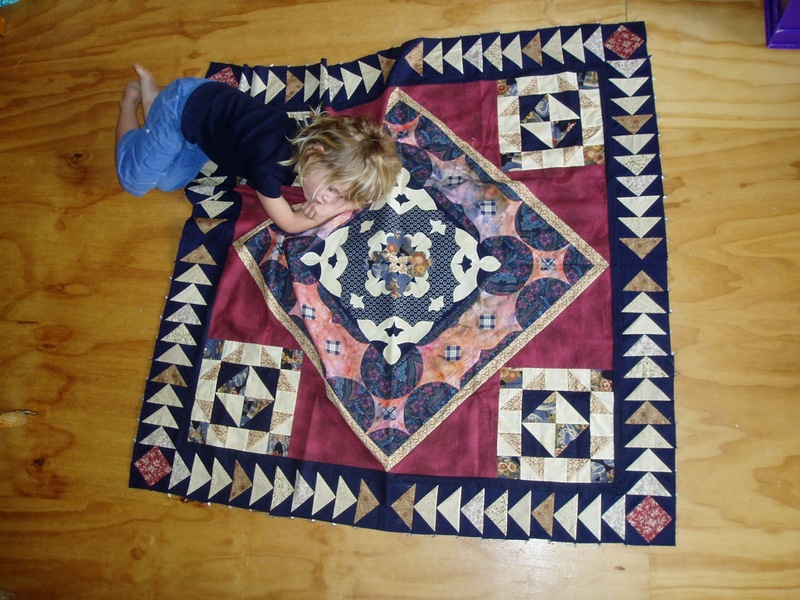 But they know they will have exactly what they need for that quilt and if they are making something that will last a few generations, then the lump sum is probably worth it. 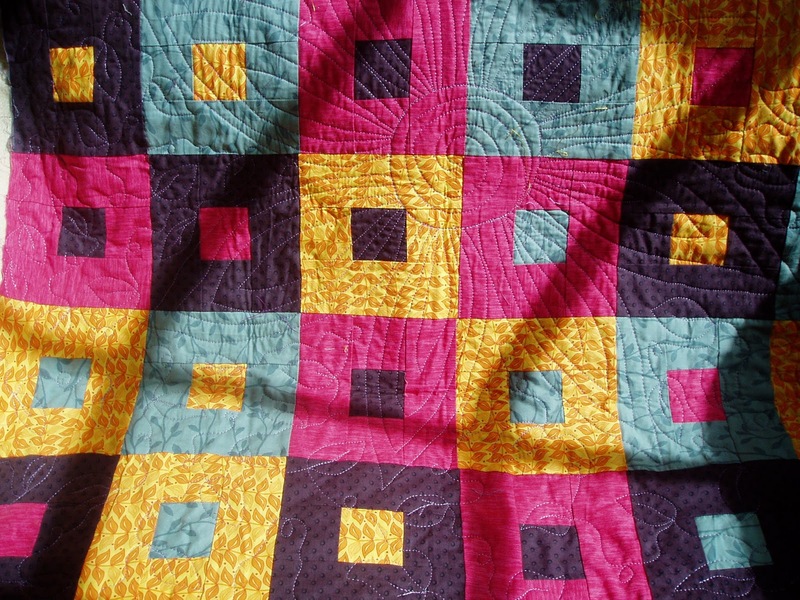 Lots of quilts around are made up of one co-ordinated fabric range. They are promoted so that you buy that designers fabric, but you don't have to make your quilt like that, and in fact, I think it gives your quilt a more distinctive 'you' style if it's made from bits and pieces that you have collected. Dyelots do change from batch to batch, but you will always find fabric to co-ordinate - there are only so many colours on this earth! 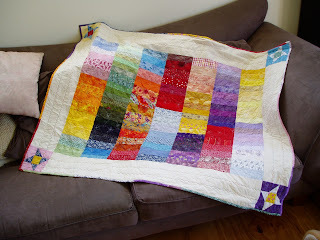 A quilt I made with lots of lil' bitty pieces of many different fabrics. ﻿﻿As for how to afford the fabric? I save up my dollars and browse shops when they are having sales and buy a few bits and pieces that are a good price. I always check the 'specials' bin and I visit op shops and cut up cotton shirts, skirts and sheets that I've bought for a dollar or two. 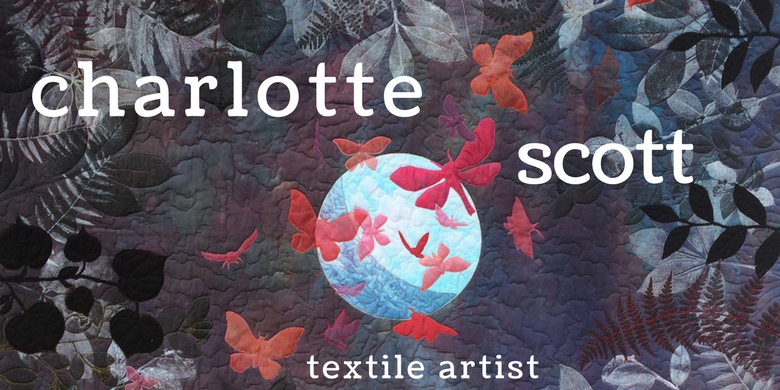 Specialist quilting shops have beautiful fabrics and lovely quality, but their prices reflect that. But a small amount of stunning fabric can be used as a feature, and the background fabrics can come from a cheaper place such as Spotlight. 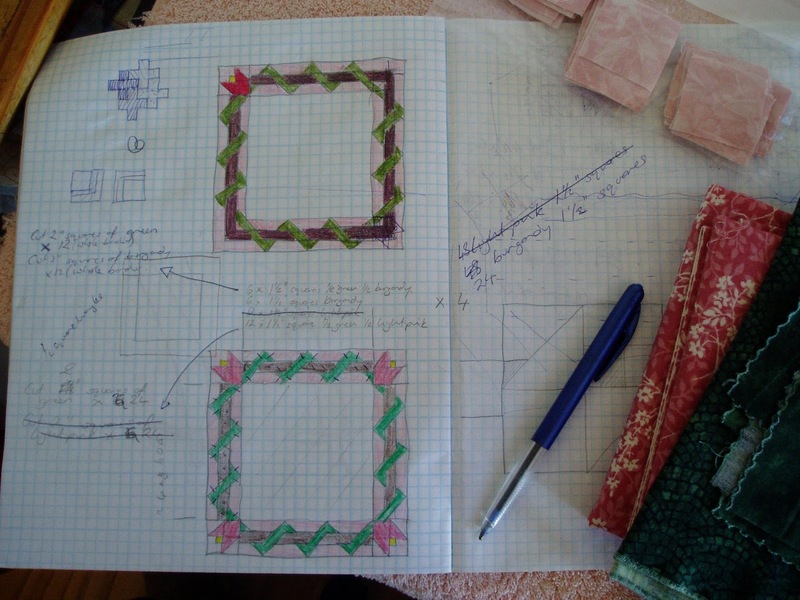 If you are planning to do a lot of applique with little pieces, then fat quarters and fat eighths might be the way to go. 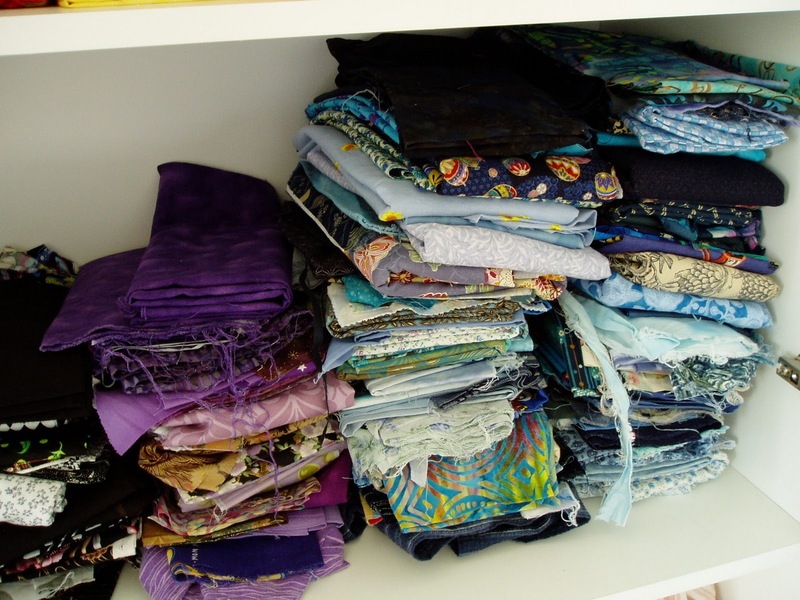 If you think carefully before you buy what you might use that fabric for, you might realise that it would be better to buy a metre's worth of fat eighths and get a really good range of colour than to buy a whole metre of one fabric that you will only use a small amount of. But fabrics that you are likely to use as backgrounds or the backing of quilts - buy several metres when it's on special. Check out the shops 'extra wide' backing fabrics. These are ones made extra width to be put on the back of quilts without having to join lengths. If you work out price per metre, you can frequently be onto a bargain and they are often perfect for backgrounds or borders (and backings of course!). I have spent a bit of time on the net and worked out which internet shops have good prices and subscribe to their newsletters to hear about sales. I also get my plain black and white fabrics and my battings from my local guild who can buy them wholesale. Sometimes buying from overseas can work out cheaper than local even when you factor in postage, especially when you split the postage with a friend. 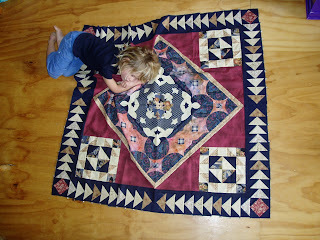 Check out http://greenfairyquilts.com/ and use an online currency converter to get an idea. There is a quilting saying,"She who dies with the most fabric, wins!" I guess like any true addict, I have found many ways and means of sustaining my habit. And I figure that the money I save on not styling or cutting my hair, not buying designer clothes and only buying new shoes when I NEED them, lets me have a little leeway. 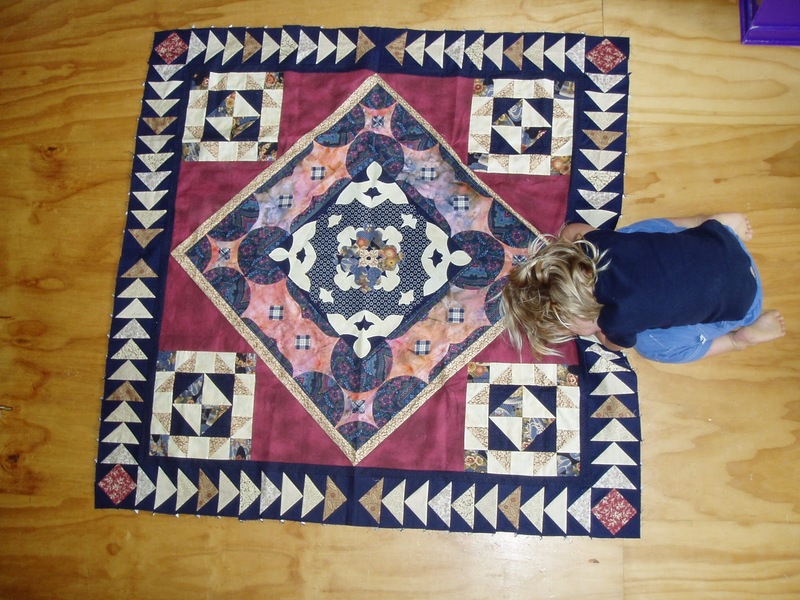 Don't try and photograph your quilts when there are small children around! The little darlings believe the world revolves around them and just cannot let a photo op go past. 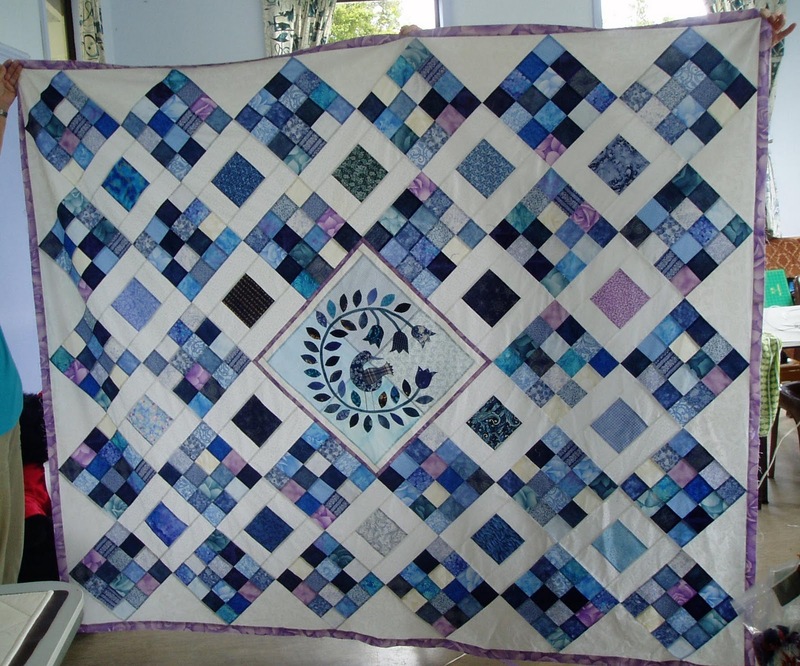 This piece of delight is one of the quilt tops that has been back and forthing it between my sister and I for about two years. 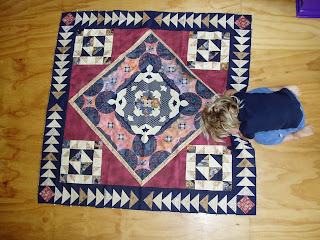 I made the centre medallion, she put the next border on and so on. The luscious flying geese were done by her. You can read more about our process here. She also posted me her top which you can see here (I gave up photographing remember) and now I'm one border behind her - looks like I need to brush up on some flying geese techniques! Today I've been sneaking moments between kiddy watching and hubby helping to practice my machine quilting. I've basted up a pile of 12 inch quilt squares and will use these to try out new ideas and just practice, practice, practice. 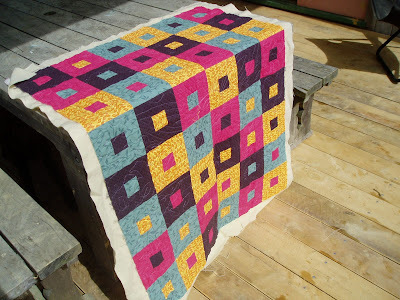 I think that next time I'll make my quiltlets about 16 inches square to have a little more wiggle room but still have them easy to move around under the machine. 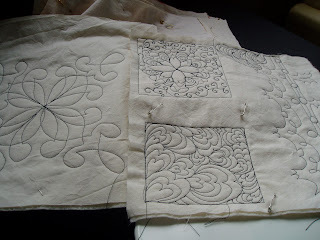 Tomorrow, I'm attending a workshop on hand quilting. It's something I've never done before, never even attempted, so in other spare moments, I've been watching a few YouTube How-To videos for prep. I'm not sure if it's something I'll do much of, but I want to learn so I can at least have an educated opinion on it. I hope you're all having a satisfying weekend too. Last weekend found me sewing my little heart out at our guild retreat. We hold these two or three times a year. We start on Friday morning and pack and clean up on Sunday after lunch. In between, all we do is talk, sew and eat - bliss! 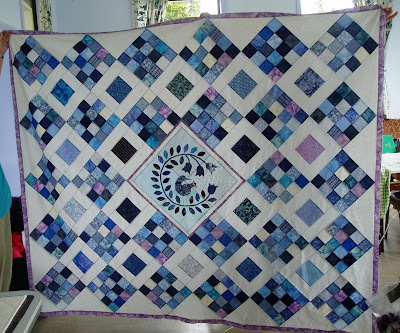 I got my applique block (it's a pattern from Material Obsession Two) bordered and sewn into my blue and white quilt top. I also added a lilac border around the whole thing and am very pleased with what I see so far. However, it's not quite big enough so I'm collecting light blue fabrics for a eight inch wide border and will be subjecting myself to more applique in a similar style. And here is how my paper-piecing project is coming along. Sorry about the dark photo - is was taken at night at my friend's house where I go for my 'stave off insanity' Wednesday night quilting session. 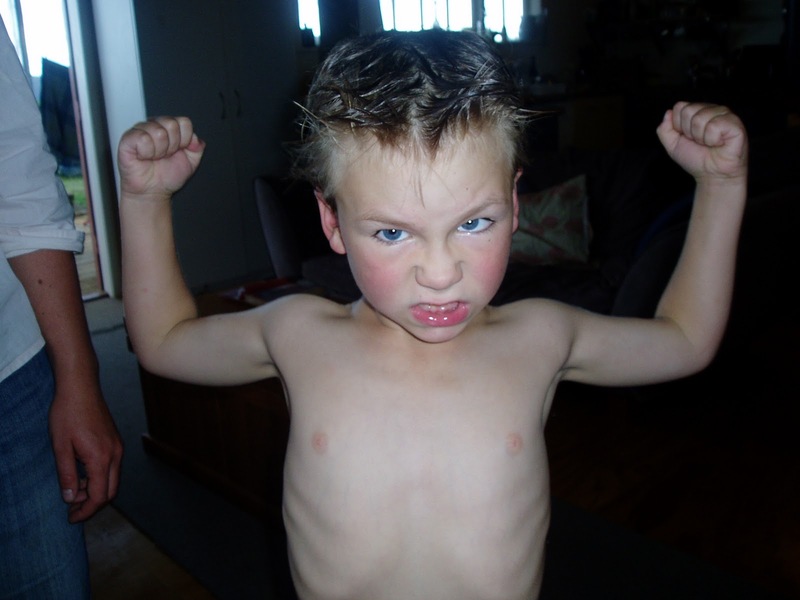 And, just for fun, here is one of the causes of my budding insanity! I've checked my swan plant mournfully all season. 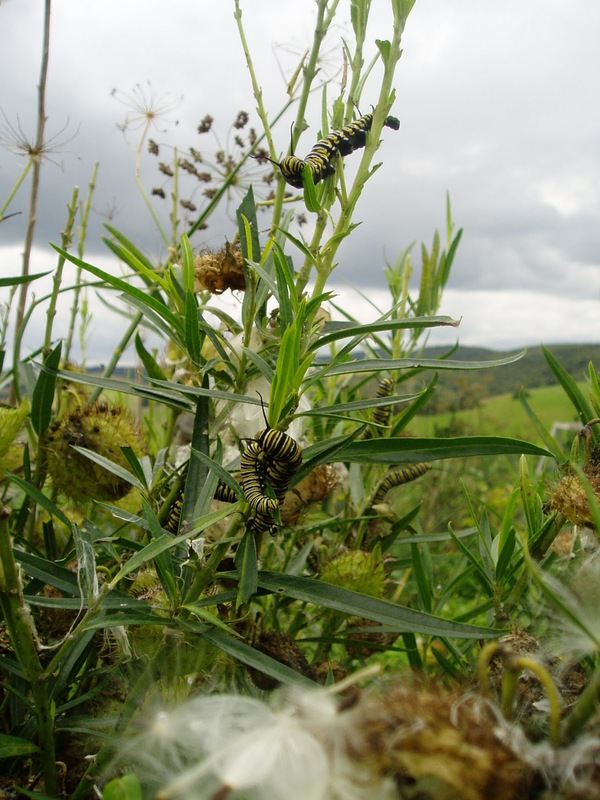 Not a single Monarch caterpillar to be found. Mind you, I hadn't seen any butterflies around either and we are not exactly in suburbia where flower gardens abound. But then I found a paper wasp nest (they eat caterpillars for lunch) in the swan plant. I disposed of it a few weeks ago and now I can't believe my eyes. 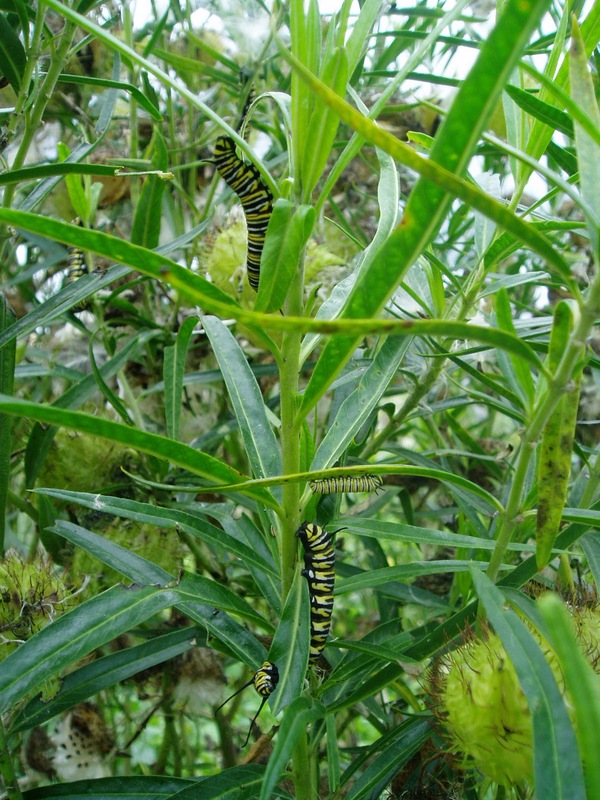 The plant is covered in black, yellow and white striped munchers. And some of them are big! The plant is pretty big and seems to still have plenty of leaves so I'm just going to let them go for it and hopefully some of them will make it through to butterfly stage. 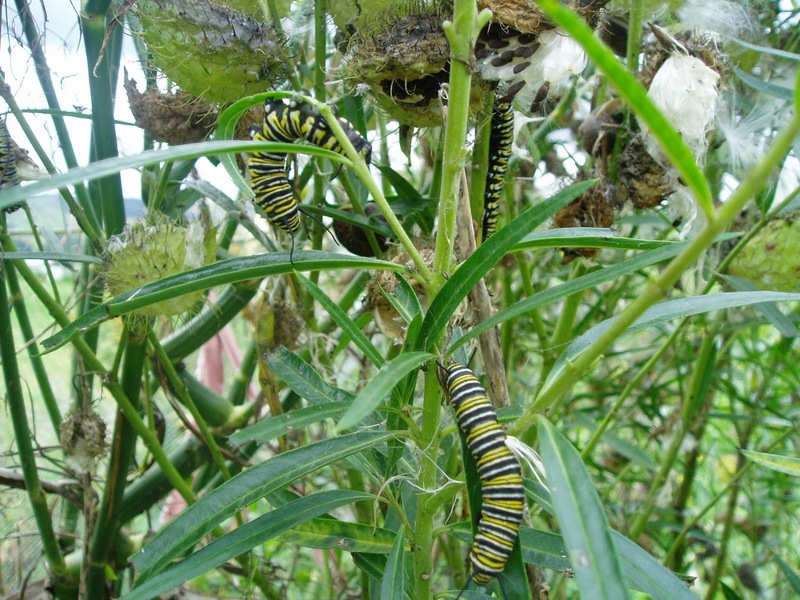 Go little caterpillars!! My very good friend, Pip, over at "Life, but not as you know it" is very generously running a raffle to help raise funds for the Christchurch Earthquake appeal. She is an extremely talented knitter (something that I'm particularly envious of - because I can't do it!) and is raffling two gorgeous children's vests. Now, isn't that the sweetest little bundle of fluff you ever did see? I don't think you can see them all, because they tend to like sitting on each other's heads when they are startled, but there are ten which hatched from twelve that I had set in the incubator. 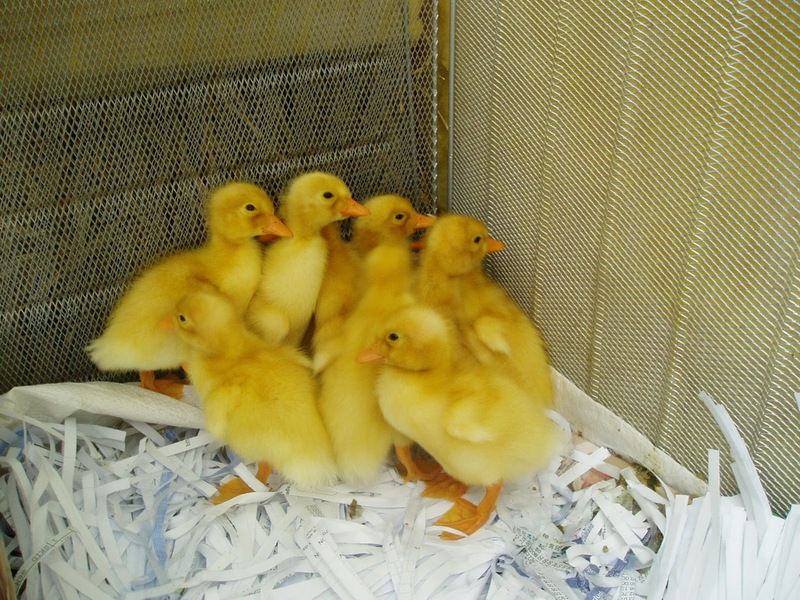 They are Pekin ducks from my own ducks who lay very well, but don't sit and hatch ducklings. 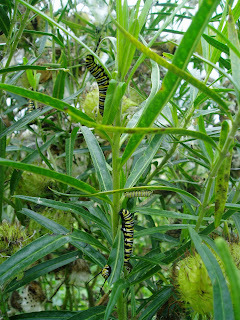 They also grow very fast and are ready for eating at eight weeks old. The best part of it, is that they are in their brooder in the new shed, NOT in my bathroom. Because although they are cute, they also poop, and poop smells. There is a window being installed! This windowless dungeon has been very dark and dingy for the last few weeks as the builders took out the Clearlite roofing panel and put corrugated iron on instead in preparation for it one day having a ceiling. 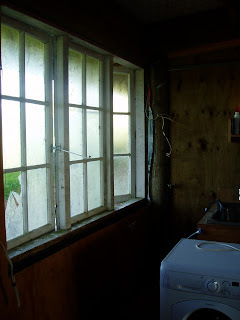 But now it has a new lease of life (and a whole lotta sawdust) with this window. The window is an old wooden one that has been sitting behind our shed, hence the grime and the broken pane. 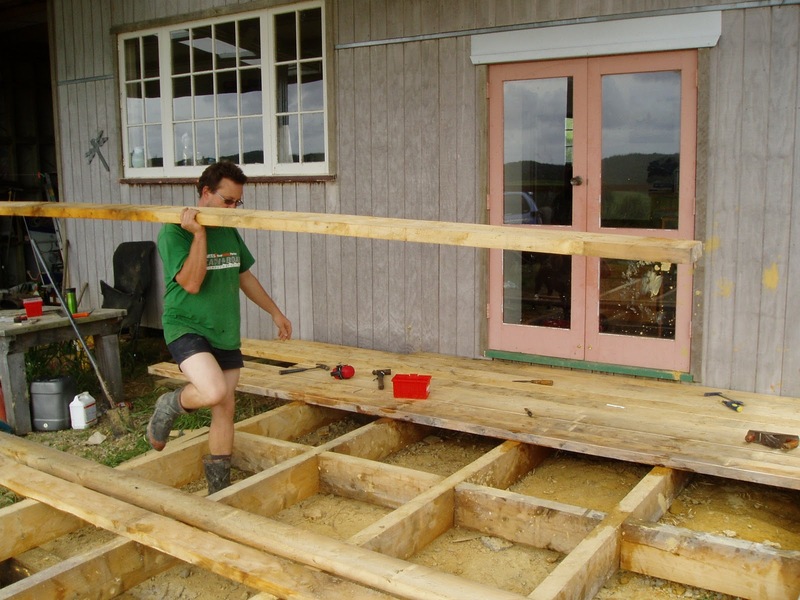 There is also a floor going in in the last bay of the shed between the bathroom and the back door - no more stepping down dodgy steps onto dirt in the middle of the night. 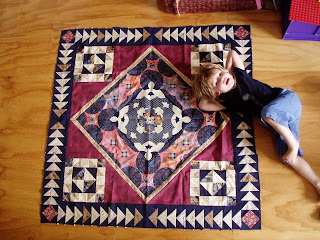 What is more, is that that floor will one day be the floor of my sewing room!! I've had trouble finding words to write lately. I think it's just a general tiredness that has infected my life lately and permeated into my blogging life too. I dare say the Christchurch earthquake has something to do with it. So to try and find my blogging mojo again I've decided to go back to how I originally envisioned this blog. Just a little story about my little life. Written for me, my family and my kids and anyone who's interested. When I started a web log I saw this as a good way to keep a diary, a diary with pictures! My kids can look back at it one day and see what their life was like, what my life was like. My family overseas can read it and keep current with what I'm up to. And of course, anyone else who is interested can read along too. So in that spirit, I'm not going to worry about writing something fun or informative, or taking pictures of something beautiful, I'm just going to write about what I'm doing, right now, today. 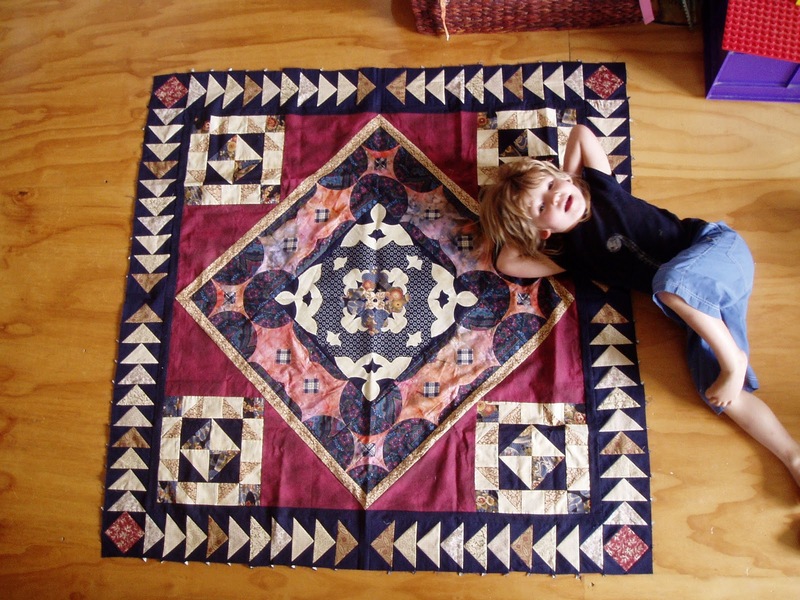 Which is quilting. I'm making bias strips for my applique panel in the centre of my big blue and white quilt. It's the first time I've used bias press bars (borrowed from a friend - thanks!) and I like them. Even my falling-apart iron can't stuff them up. 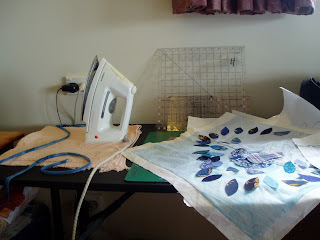 I bought a trestle table a little while ago and having that extra surface has allowed me to get rid of my clunky, annoying ironing board and just press my small bits on a old, folded towel. 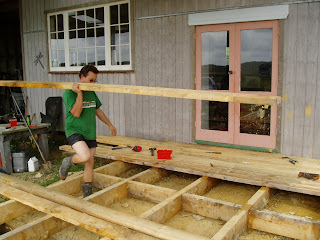 Meanwhile, outside Hubby is building a deck. What with having the shed extension and veranda finished he's got all enthusiastic - but who am I to complain? It will get us up and out of the mud this winter. Fantastic! And what are the kids up to? Nothing much. 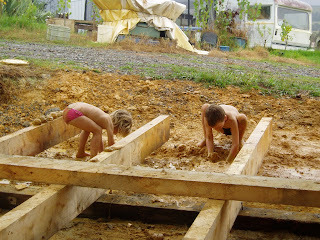 Just playing in the mud, like all good kids should do.﻿ They need to get in as much outdoor play as they can because the weather in changing, Autumn is on it's way.